The Penacook Community Center, Inc. is looking for an energetic, conscientious and detail-oriented individual who enjoys making a difference, being part of a team and takes pride in their work. 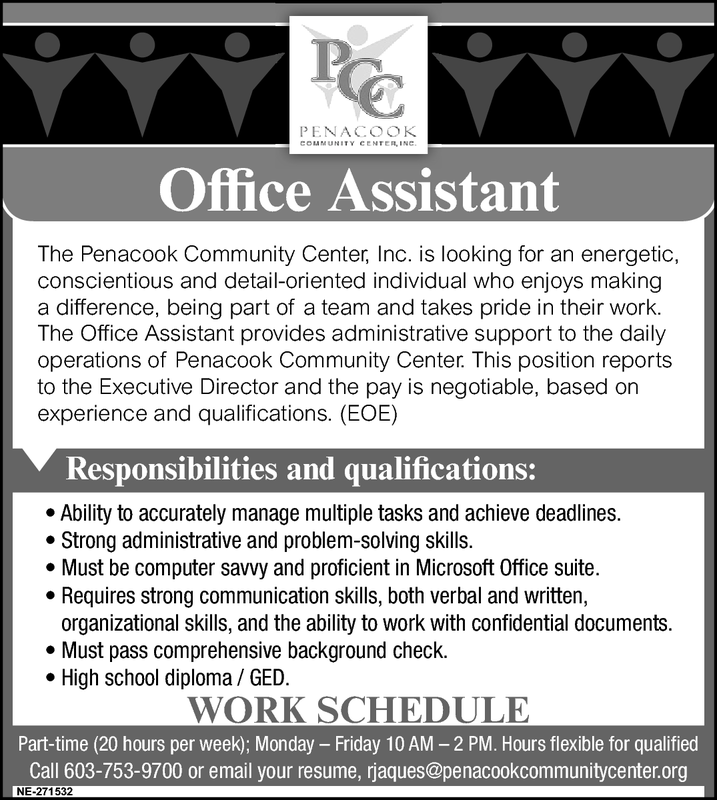 The Office Assistant provides administrative support to the daily operations of Penacook Community Center. This position reports to the Executive Director and the pay is negotiable, based on experience and qualifications. • Ability to accurately manage multiple tasks and achieve deadlines. • Strong administrative and problem-solving skills. • Must be computer savvy and proficient in Microsoft Office suite. • Requires strong communication skills, both verbal and written, organizational skills, and the ability to work with confidential documents. • Must pass comprehensive background check.